Trump vs the Fed: Who Wins? It’s the President who submits the annual budget to Congress, but it’s the House of Representatives and the Senate that vote on appropriations bills - outlining discretionary spending and/or tax laws - which are then passed onto the President for his signature. The Constitution is important to keep in mind as we examine in this article the very interesting spat that is brewing between US President Trump and the Federal Reserve. At the heart of the dispute is the Fed’s current course of action, raising interest rates in line with a so-called healthy US economy, which at the same time, is keeping the US dollar high (since 2015 the Fed has raised interest rates eight times). This policy is in direct contradiction to one of the Trump Administration’s main goals, which is to win jobs back to the US and reinvigorate the domestic economy with “made in America” goods. To do this requires a low dollar for exports and low interest rates. Keeping borrowing costs low is good for American companies and consumers because it stimulates spending, and the stock markets. We’ll get into the conflict and its implications, but first, a primer on the Fed. The Fed operates as a central bank, controlling fiscal and monetary policy. Its three goals are to promote maximum employment, keep prices stable (ie. control inflation) and to moderate long-term interest rates. But the Fed is “independent” in that it is not a part of the US government. While the US President appoints its seven-member board of governors, including its chair (appointments must be approved by the Senate), he has no direct control over its policies - though he’d certainly like to. Woodrow Wilson made sure that the Treasury Secretary and the Comptroller of the Currency were ex-official members of key Fed Boards. Harry Truman fought and lost an epic battle against the Fed. Lyndon Johnson, Ronald Reagan and George Bush I had troubles with the Fed. Richard Nixon gained total control of the agency. Jimmy Carter did not and paid a price. Thus, if Donald Trump goes to war against this institution he is more in line with his predecessors than Clinton and Bush II. So how did the US come to have a central bank that is independent from the government, anyway? It all goes back to November 22, 1910, when a delegation of the nation’s leading financiers, led by Senator Nelson Aldrich, left New Jersey for a very secret 10-day meeting on Jekyll Island, Georgia. The Fed began with approximately 300 people, representatives of banks who became owners (stockholders purchased stock at $100 per share) of the Federal Reserve Banking System. 100% of its shareholders are private banks; the stock is not publicly traded and none of its stock is owned by the US government. The Federal Reserve Bank (Fed) is a privately-owned company (Wikipedia describes the Fed as a “complex business-government partnership that rules the financial world”) that controls and profits immensely by printing money through the US Treasury and loaning money out to commercial banks. Commercial banks borrow from the Fed to meet reserve requirements established in law (set up after the 1929 stock market crash to avoid another run on the banks which caused many to become insolvent). This is known as the discount window. Borrowing from the Fed is quicker and easier than borrowing from another bank, but it is more expensive - the higher rate is known as the discount rate. The Federal Reserve pays the banks interest on their required reserves and on their excess reserves at the Fed. It can also lower banks’ reserves - allowing them to lend more to businesses, consumers and other banks - which increases the money supply. 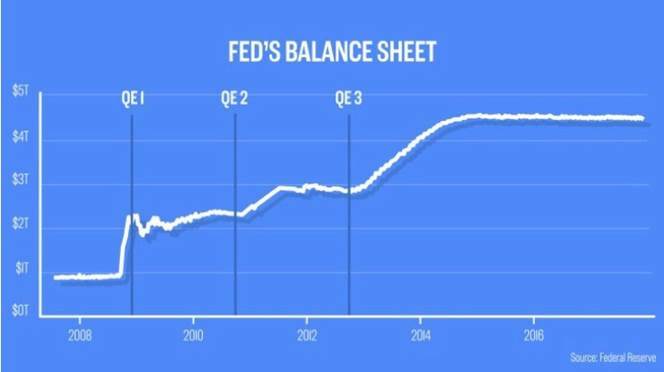 The other way the Fed increases the money supply is by purchasing government securities like Treasury bonds - a tactic known as quantitative easing - the idea being to stimulate the economy by making more money available and pushing down interest rates, making borrowing attractive. Between 2008 and 2015 the Fed bought trillions of dollars worth of T-bills and mortgage-backed securities, keeping interest rates near zero percent, but making the US debt balloon from $900 billion to $4.5 trillion. In January the Senate approved President Trump’s appointment of Jerome Powell as the next chairman of the US Federal Reserve. The term of former chair Janet Yellen expired in February. Powell was seen to be a safe bet for the Trump Administration since he is a Republican, a multi-millionaire former banker, and was expected to support low interest rates. However so far this year the Federal Reserve has raised interest rates three times - to the disappointment of Trump who prefers to keep them low. Last week Trump reportedly told the Washington Post he’s “not even a little bit happy” with his appointment of Jerome Powell, and that he thinks the central bank is “way off base with what they’re doing.” Trump argues the rate increases are hurting the US economy and blamed the Fed for the October stock market sell-off and General Motors’ plans to close plants and cut over 14,000 jobs, according to WAPO, via CNBC. Rising rates also boost the dollar, which has increased 3.6% over the past six months, as of Wednesday noon. Again, this is contrary to what Trump said he wanted, even before his inauguration in January 2017. A lower dollar helps US exports and boosts foreign earnings of US corporations. Treasury Secretary Steve Mnuchin said the same thing at the World Economic Forum in Davos earlier this year. “Obviously a weaker dollar is good for us as it relates to trade and opportunities,” he told reporters. Trump has also said he doesn’t see the need for hiking interest rates since inflation is relatively low, currently 2.5%. The rationale for raising interest rates is a healthy economy. By some measures this holds true, by others, not so much. At its last Federal Open Market Committee (FOMC) meeting in September, in raising the federal funds rate to 2.5%, the Federal Reserve stated it expects US GDP to rise by by 3.1% in 2018, better than the 2.8% forecast in June. Unemployment is at a 49-year low of 3.7%. Wages are growing and rising exports pushed the trade deficit to a seven-month low in July. However critics say the job gains have been due to the stimulus package the Trump Administration rolled out late last year - $1.5 trillion in tax cuts. Once that stimulus is spent, and all the hiring is done, the number of unemployed may creep up. Another casualty of the tax cuts is a whopping increase to the US debt, which currently stands at $21 trillion. USA Today notes that as of Sept. 30, the US deficit was $779 billion - 17% higher than last year. 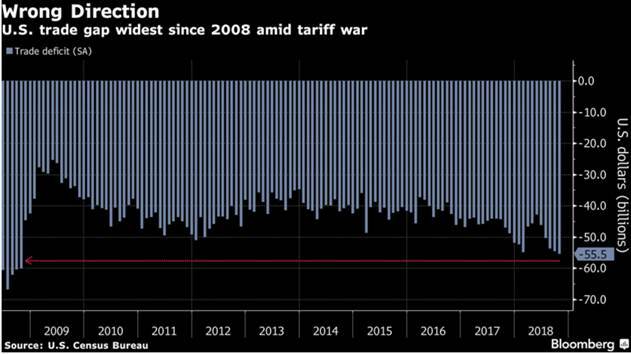 GDP growth is seen as stimulus-driven, along with the export surge in the summer, with a lot of it having to do with companies exporting large volumes of industrial material and soybeans - of which China buys a third from the US - ahead of Chinese import duties taking effect. In other words, current growth is like the sugar high you get from eating carbs - an instant energy rush followed by fatigue. 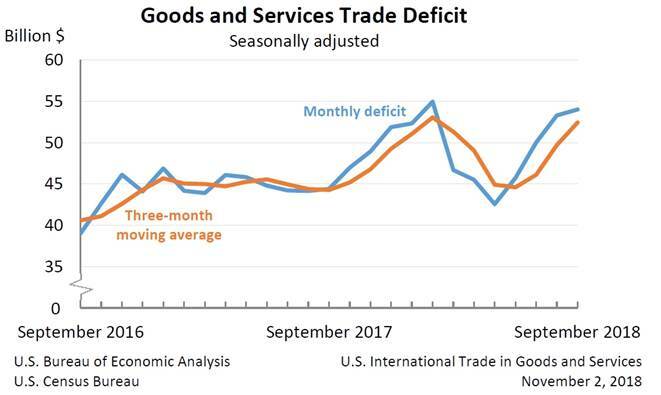 Meanwhile the trade deficit that Trump railed against during the 2016 campaign, and which he vowed to fix by re-negotiating trade deals and starting a trade war with China, is moving in the wrong direction. 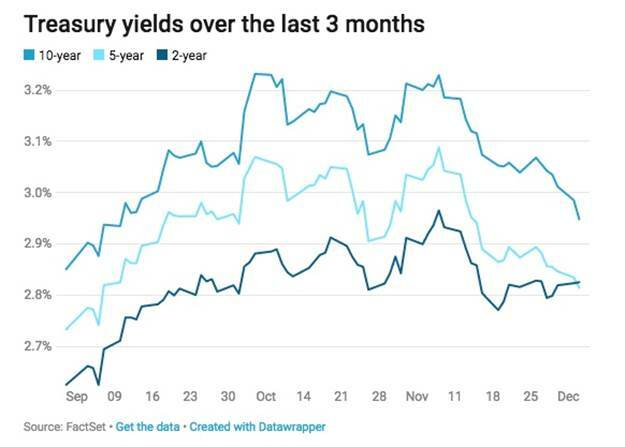 But the real indication that all is not well with the US economy came on Tuesday, when the Treasury yield curve “inverted”. That means short-term interest rates climbed above long-term rates (2-year vs 5-year bonds), for the first time in a decade. Or as economists say, the spread between yields “turned negative”. You can see what happened in the graph below. Normally, investors require better compensation, in the form of higher yields, when they purchase long-term debt, versus short-term debt, due to the higher risk of holding the debt longer (interest rates could go down, long-term). When the opposite happens, it is considered a bad omen for equities, and historically has meant a recession is not far away. The yield curve inversion was the main reason for a stock market pullback on Tuesday - the second such correction since early October. The Dow Jones Industrial Average fell 800 points; among the worst-hit stocks were the FAANGs (largest tech stocks), which shed over $140 billion in market value. What could the yield curve inversion mean? Some portfolio managers are telling clients to reduce stock holdings due to the likelihood of increased volatility and a short-lived “baby bear” market in 2019, Bloomberg said. It could also cause the Federal Reserve to re-think further planned interest rate hikes. If the Fed is uncomfortable with shorter-maturity bonds yielding more, the central bank could ease tightening. If that were the case, the dollar would fall, and the price of gold and other commodities would go up. The USD and commodities usually move in opposite directions. Gold hit a three-week high on Monday due to US dollar weakness. While the Fed’s Summary of Economic Projections from September suggested another interest rate hike in December and three more in 2019, last week Powell appeared to contradict that, saying the Fed was getting closer to the “neutral interest rate” which is the dividing line between tight and easy monetary policy. The stock market rose on what was seen as a dovish signal. However John Williams, President of the Federal Reserve Bank of New York, told the press on Tuesday he sees no reason to deviate from the Fed’s path of gradually increasing rates as long as the economic data support hikes. Will the Fed lumber into another interest rate hike even though a recession is looming, inflation is under control, and stock markets are jittery? Or follow the chair’s lead and stop the raises with all this uncertainty? We’ll know when the FOMC meets on Dec. 19. Along with recession worries, the markets have also been volatile lately due to an apparent ceasefire in the China-US trade war that occurred last Saturday. While that seems like a good thing, the details are unclear. For those who missed it, Trump and Chinese President Xi Jinping seemingly agreed to a truce in the dispute which has seen duties on hundreds of billions of tariffs imposed by both sides. Trump told Xi at the Group of 20 summit in Buenos Aires, that he will hold off on a planned increase Jan. 1 to 25% from 10% tariffs on $200 billion worth of imports from China. In return, China will buy more American-made farm, energy and industrial goods. Trump has been keen to target China with tariffs - starting with steel and aluminum in March - in an effort to cut America’s trade deficit with China which has been a thorn in Trump’s side and an election issue he campaigned on. The real estate-mogul President is also trying to exact concessions from China on subsidies for Chinese industries and forced technology transfers from American companies, in exchange for access to the 1.3 billion Chinese market. But a closer look at the trade war reveals that for the US, it’s been an abject failure. Could this be the reason for Trump’s capitulation to Xi at the G20? At Ahead of the Herd, we think so. Most economists think the two countries aren’t anywhere close to reaching agreement on subsidies or tech transfers - which the US government views as intellectual property theft. 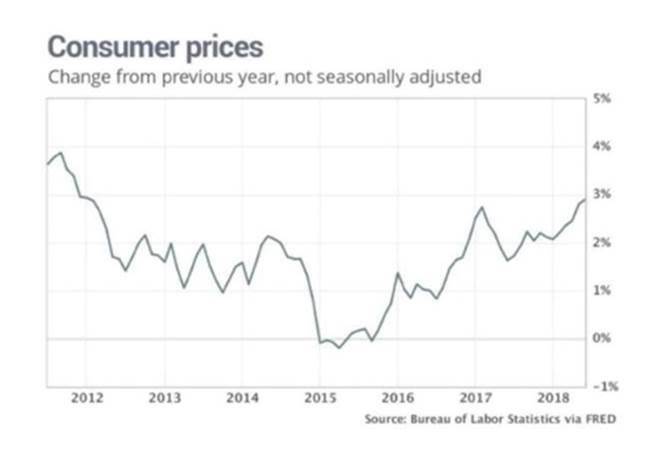 And for the average American, the trade war has only meant higher prices. Excluding food and energy (core CPI), consumer prices increased 2.2% in the last 12 months through September, and edged up 0.3% in October. Who cares if the economy is growing if your six-pack of Bud is going to take a bigger bite out of your pay check? As for the trade deficit with China, which US tariffs are supposed to correct, the Commerce Department said the trade deficit increased 1.7 percent to $55.5 billion, the highest level since October 2008. The trade gap has now widened for five straight months. Uncertainty over the impact of the trade war has also contributed to panic in North American stock markets, with several significant corrections in the last two months. The trade war has been particularly rough on US soybean farmers. Soybeans are used in animal feed and Chinese citizens consume a lot of pork and beef. US soybean shipments to China have dropped dramatically since China imposed a 25% retaliatory tariff on US soybeans in July. Less demand has also put a crimp on US soybean prices. A bushel of soybeans in November traded for $9 compared to more than $11 earlier this year. Instead of buying soybeans from the United States, the country turned to Brazil, Russia and Canada instead. 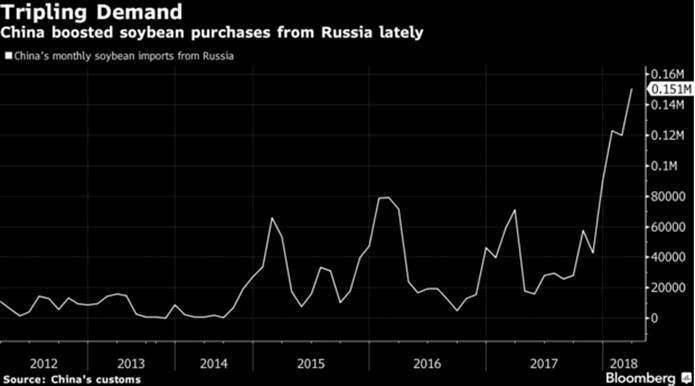 In May China bought a record amount of soybeans from Russia. The country is also buying less soybeans. In October Chinese soybean imports fell to a 12-year low, due partly to the trade dispute but also due to high local stockpiles, and curiously, a proposal to use less protein in livestock feeds. US farmers are cautiously hopeful the trade ceasefire will lead to a resumption of the US-China soybean trade. Meanwhile China does not appear to be suffering from the trade war. In fact duties on American goods have just pushed forward China’s long-term plan to create “global champions” in robotics and other fields, notes CTV News. Underlying the Trump Administration’s failure to bring the Chinese to the negotiating table is the fact that China actually doesn’t need the United States as much as America thinks they do. Trump and co think that all the US needs to do is keep piling on the tariffs and Chinese President Xi Jinping will bend to its will. The reality is quite different. China’s long-term objective is not to tie itself more closely to the US, but rather to become more economically independent. We see this through its Belt and Road Initiative, the means for creating a trading block that can function independent of its traditional Western trading partners. Whose side is the Fed on? Back to Trump and the Fed, consider which side is the US Federal Reserve on? If the goal of the Trump Administration is to reduce America’s trade deficit with China (and its overall trade deficit), the best policy is to keep interest rates low, which will keep American companies borrowing and growing, and to maintain a low dollar. Instead, the dollar has been rising, making US exporters less competitive. Rising interest rates are hiking the cost of borrowing for companies, making it harder for them to expand their workforces, buy new equipment, etc. The Fed and the government are working at cross purposes. How can it win a trade war when the very weapons it could use (low interest rates and a low dollar) have been confiscated? Along with pushing through a huge corporate tax cut that has resulted in record share repurchases that will only benefit corporate managers, not retail shareholders, the Trump Administration has also gutted the Environmental Protection Agency (EPA), promoted the coal industry, and proposed slashing clean energy funding in the 2019 budget by 72%. A couple of weeks ago, despite overwhelming evidence of climate change in the United States (warming oceans causing destructive hurricanes carrying unheard of wind speeds; over 50% of the country in drought conditions this past summer; the worst California wildfires on record that have killed 85 people and destroyed over 10,000 structures; depleted fresh water supplies, etc.) President Trump tried to bury a climate change report by his own government. The study by 13 agencies and over 300 climate change scientists warned of the catastrophic impacts of climate change. Trump ordered the release of the report on a Friday afternoon (an old trick to prevent reporters from writing stories), then said later he doesn’t believe it. Here’s a novel approach for the US government: instead of fighting climate change, why not embrace it? Seize this opportunity to lead the world in developing clean energy technologies that will help reduce carbon emissions, not add to them. Start with the electric vehicle industry. Make it your mission to get car makers and motorists off of gas or diesel-powered vehicles and into EVs. Build the charging infrastructure. Build a mine to lithium battery supply chain, by supporting domestic exploration to reduce US dependency on critical minerals like lithium, magnesium, cobalt and rare earths. Consider the trillions of dollars in savings that could be reaped from getting Americans off their addiction to fossil fuels. A group of institutional investors with $1.9 trillion under management is pressing oil companies to resist Trump’s methane rollbacks. The rollbacks - proposed by the EPA, ironically - ease requirements for the oil industry to detect and repair methane leaks. Methane is an especially powerful greenhouse gas. As the main component of natural gas, it warms the atmosphere 84 times more than carbon dioxide. The EPA says its changes would save $75 million in regulatory costs annually. That’s not a lot of money, by government standards. Compare it to the amount of money the Clean Air Act reportedly saved Americans in health care costs between 1970 and 1990: $22 trillion. The costs to comply with the act - first passed in 1963 and later amended - were $0.5 trillion. A report released in 1997 asked Congress to determine whether the Clean Air Act “was worth it”. In working out the health care costs saved, the retrospective analysis “predicted an annual reduction of 184,000 premature deaths, 674 cases of chronic bronchitis, over 22 million lost days at work, and other outcomes,” according to a 2012 article in The Atlantic. Was it worth it? Yes, obviously. In contrast, one of the first acts of Scott Pruitt, Trump’s pick for head of the EPA, was to repeal President Barack Obama’s signature policy to curb greenhouse emissions from power plants - passed in 2015 as part of his Clean Power Plan. It should also be noted that in reducing the EPA’s regulations by up to 80% - including an executive order signed by Trump last year that gave the federal government the authority to limit water pollution - the Trump Administration’s cuts were actually unnecessary. 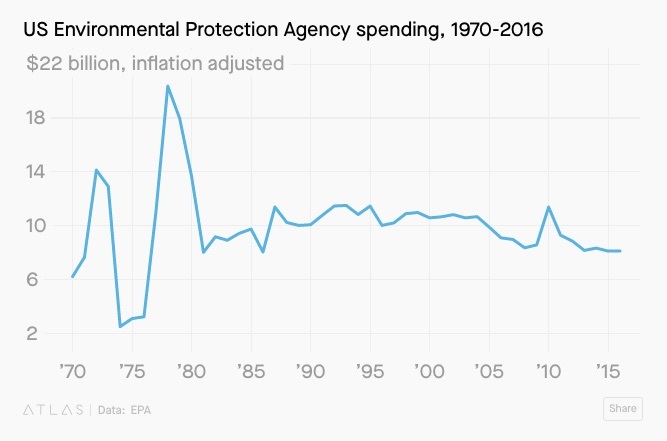 According to research by Quartz, EPA spending fell under Obama to its lowest point since the 1980s, just $8.3 billion in 2015. The agency’s spending was more than double that, during the late 1970s. 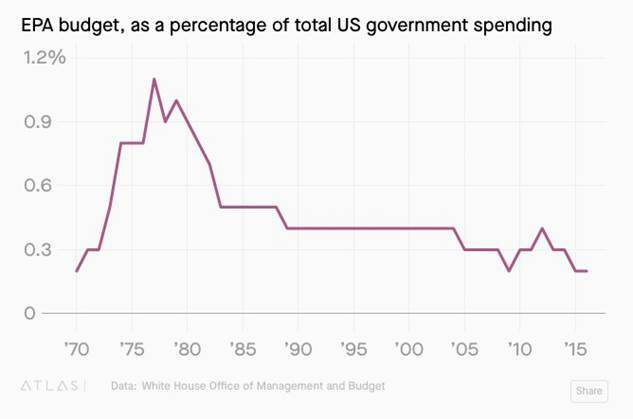 It has also dropped considerably as a percentage of total government spending: in 2015 it was less than 0.3%. Compare the EPA’s budget to other government departments and agencies: $1,110 billion for the Department of Health, $576 billion for Defense, and $540 billion for the Treasury. Even NASA is higher, at $19.2 billion. The current situation of the US Federal Reserve working off a different agenda than the Trump Administration is untenable. Trump and Powell need to get on the same page. How can the United States win a trade war against China (a doubtful goal in the first place given what’s happening there in terms of infrastructure build-out and the move from an export-driven to a consumer-driven economy), when the Fed is throwing a wrench into Trump’s plan to keep Chinese goods out and increase the export of American goods? So far the only area it’s working seems to be oil. The United States last week became a net exporter of oil for the first time in 75 years. Then again, the Fed, being independent of the US government, doesn’t really care what the Administration’s goals are. Its mandate is essentially to keep the economy running smoothly. If that contradicts some ill-conceived trade war the President has cooked up, so be it. There’s also the profit motive. In 2017 the Fed reported $115 billion in income, including $113 billion in interest received from $4.2 trillion in Treasuries and mortgage-backed securities it accumulated during its quantitative easing programs. It also paid out $784 million in dividends to shareholders - the financial institutions that own the 12 Federal Reserve Banks. Trump’s strategy to hit China with a low dollar and low interest rates is a good one. The problem is, without the Fed on board, it’s going nowhere. They should be cooperating to beat China, which we’ve argued, is the biggest threat to the United States (not Russia) but instead, they’re at loggerheads. How will this end?